Although the current weather situation might not be a telling sign that warmer days are coming, we’ve heard an Indian Summer isn’t to be ruled out this month. That’s why we’ve been busy experimenting in the kitchen for something delicious to serve when entertaining this September. 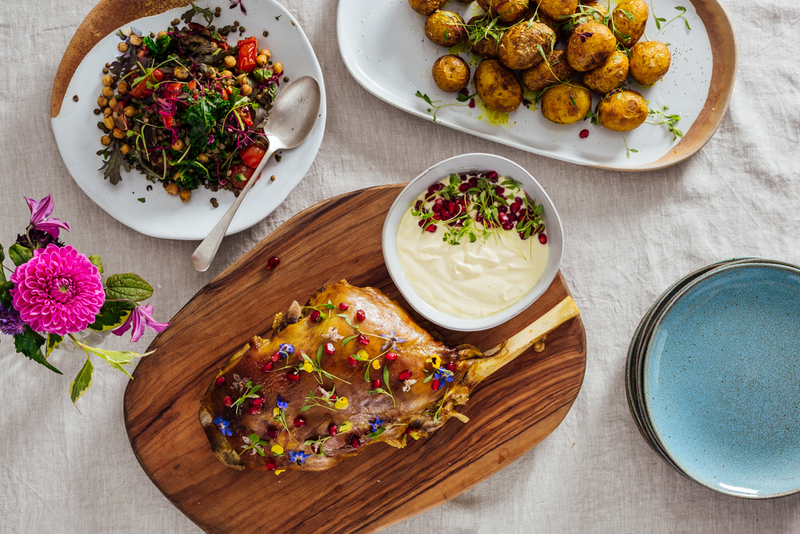 Owner and founder of Social Pantry, Alex Head, pairs this sharing style leg of lamb with her tomato and lentil salad for an inviting and delectable dinner combination. 1. Stir together the marinade ingredients and season with ½ tsp ground black pepper and 1½ tsp flaky salt. Slash the lamb several times on both sides, then massage the marinade all over it. Seal into a large food bag or non-metallic container and chill overnight (or at least for a few hrs). Let the lamb sit at room temperature for 1 hr before roasting. 2. Heat oven to 220C/200C fan/gas 7. Put the lamb into a foil-lined roasting tin and roast for 20 mins. Turn the oven down to 190C/170C fan/gas 5 and roast for 1 hr 20 mins for meat that’s pink near the bone. Cover loosely with foil halfway through cooking or once the marinade has charred and the meat looks golden. 3. Leave the lamb to rest for 20 mins before carving, then serve with lentil & tomato and cucumber salads (see related recipes).